Click Here for the Best Deal on Jack3d and Get your Carnosyn in! Hey everyone, we have a small bit of news here. In 2012, the label of Jack3d has a few minor changes, and the great is news is that they’re for the better! In the last article, we discussed how great Beta Alanine is. But things just got better. Rather than using any old form of beta alanine, USP has moved to CarnoSyn® brand beta alanine. This is the most pure, trusted form of BA on the market. We’re not really sure what USPLabs was putting into it before, obviously it worked well for everyone (or else it wouldn’t have so many great reviews), but it’s great to have the assurance that USPLabs is putting their money where their mouths are, and using the finest supplements money can buy in the finest pre workout supplement money can buy. CarnoSyn® Beta-Alanine is protected under patents 5,965,596, 6,172,098, and 6,426,361. The company that owns this is Compound Solutions, a nutraceutical supplier based in California. This is not some garbage supplement that is shipped in from China. As the owner of this website, I know for a fact that these low-quality, foreign supplements pose a HUGE problem to the industry. I constantly get emailed asking to buy this junk from China. CONSTANTLY. With those products, you think you’re getting beta alanine, but you’re also getting loads of impurities and even ash from nasty manufacturing plants and impure processing. No thanks. Anyway, not the case with Jack3d. USPLabs is getting this stuff from a certified, patented company in California. Not only that, but Compound Solutions has been around since 1998, and are always discovering and researching new ways to improve the industry — and make you improve your fitness as well! Note that the dosages are exactly the same here, the flavor systems are the same, etc. This is just a type of “purity guarantee” from USP. The next label change is for some clarification to abide by the latest changes to ingredient specification requirements. 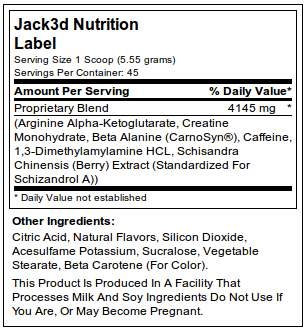 The 1,3 Dimethylamylamine used in Jack3d is actually 1,3 Dimethylamylamine HCl. It is necessary to state the exact compound, as there are a few different chemical structures. The ingredient behaves exactly like you have ever used, and this is what’s really packaged in all modern products that contain DMAA. So, while the changes are minor, we figured that we’d let you know that USPLabs is serious about giving you 100% honest, truthful information about what they’re using in their products, and using tradename beta alanine is one way of doing so.